MV2001 is a fast modern wave piercer designed catamaran. This spacious, air conditioned vessel has with capacity for 280 passengers however day trip numbers are capped at 120 for guests comfort. The vessel offers four conventional toilets, lounge style seating on the upper and lower decks as well as outdoor seating on the upper deck. We offer a licensed bar stocked with a range of beers, wines, spirits and soft drinks. Reefstar Cruises is a family owned and operated business. Ross and Lyn Courtenay and their band of local crew proudly call the Whitsundays home. Our reservations team work from the Where? What? How? Tourist Information Centre in the main street of Airlie Beach. Reefstar Cruises is proud to offer Ship to Shore services to the Cruise Ships visiting the Whitsundays. We work together with the local Cruise Ship Ambassadors to welcome visitors to our beautiful region. 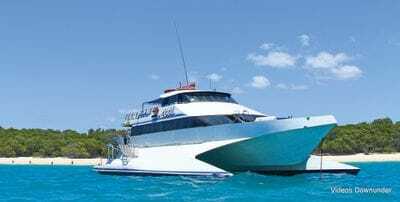 MV2001 is available for private charter and group bookings, please contact our friendly reservations team on (07) 4946 5255 or email to book.